Uncle Murphy was friends with all of the finest Citizens of the Garden. He was a Regular Member of the Ladybugs’ Home Economics Association and an Honorary Fellow of the Fraternal Order of Old Grasshoppers. He was frequently overheard discussing in detail the current events of Europe in all of the most important salons or enjoying Rosebud Tea in the trendiest cafés. He was even known to enjoy the company of the geckos and the skinks, and even the neighborhood field mice, who are known to put on airs. Upon hearing an impressive speaker, Uncle Murphy would not hesitate to inquire of the distinguished gentleman if his degree — and, in point of fact, his vocation; nay, his avocation — lay in history or in literature, as these were the only worthwhile pursuits of the modern antiquarian; philosophy and mathematics (and least as far as is useful) could simply be presupposed; neither was a worthwhile primary pursuit. But history and literature! These were the primary pursuits of a gentleman gnome. Few things in the world are certain; one absolute: Gallia est omnis divisa in partes tres. One of the great sources of sadness in my life has always been that I was not born a gnome. I blame my parents for this, for they were not gnomes either. But, I had an uncle who was a gnome. Murphy was his name. 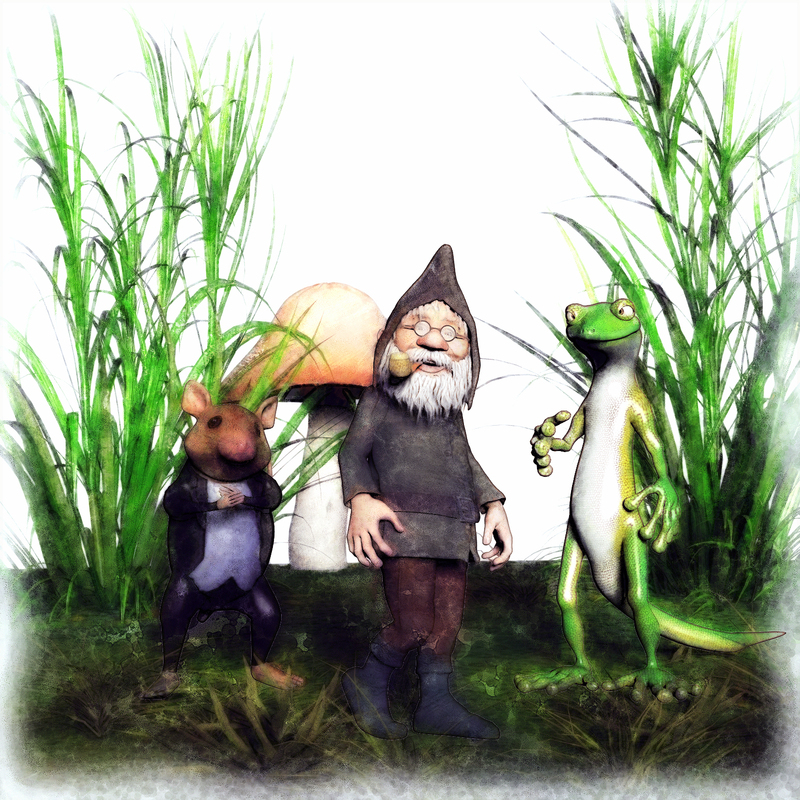 He would sneak into people’s yard at night and secretly plant mushrooms, which is very funny to a gnome. He also made his own “medicine” in a little copper still and grew his own pipe-weed in a secret garden behind the garden. He listened to the stories of the sea shells and carried on conversations with passing butterflies and bumble bees. He knew every ant by name and played chess with an elderly cricket who had travelled the world on a merchant ship, back when that was a respectable way to travel the world. 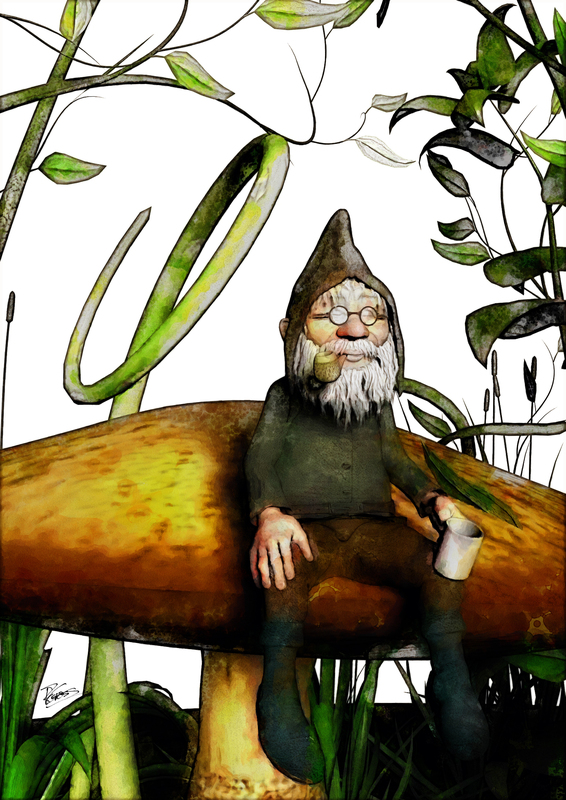 One spring, Uncle Murphy travelled to Norway to buy some very special mushroom seeds from a fellow gnome. That fall, we had red and golden mushrooms and no one knew why. In the beginning was the Word, and the Word was with God, and the Word was God. He was in the beginning with God; all things were made through him, and without him was not anything made that was made. In him was life, and the life was the light of men. The light shines in the darkness, and the darkness has not overcome it. Good morning. My name is Richard Gross, and I am here to talk today about three things: The Definition of Happiness, Right and Wrong Thinking, and Acts of Kindness and How They Affect Your Emotional Well-Being. I am, among other things, a theologian with a particular fondness for Moral Theology and a candidate for the Permanent Diaconate. God willing, I will complete my formation and be ordained to the Sacrament of Holy Orders in early June 2014. I am also, if you’re interested, a puppeteer, and avid fisherman, an award-winning poet, an amateur artist and musician, and the editor of an international magazine called The Stained Glass Quarterly. I also cast, paint, and collect toy soldiers; it’s sort of an obsession. You shall worship the Lord your God and Him only shall you serve. The Name of the Lord is holy and not to be taken in vain. The seventh day is a Sabbath of solemn rest, holy to the Lord. Honor your father and your mother, that your days may be long in the land which the Lord your God gives you. You shall not covet your neighbor’s house or anything that is your neighbor’s. That’s the list, and – indeed – it was given to us for our happiness. To live this list perfectly would result in perfect happiness. However, most of us are far from perfect and we find ourselves struggling daily just to remember these Commandments… much less live them perfectly. Fortunately, neither the Bible nor theology ends with the Decalogue. There is much that comes after, and it is important to remember that the Gospel is the Good News, not the good advice. To be a theologian – or, at least, to be a good theologian – is to be an optimist. It is to see through the lens of Christ that God loves us and wants us to be happy. That, in point of fact, He calls us to happiness. So, how do we apply this to an understanding of happiness? How can we use it to make ourselves happier? I don’t want you to come on an afternoon talk show journey with me. I’m not Doctor Phil, and I’m not going to suggest ten steps toward being happier. I’m a theologian, and I am inviting you to come on a theological journey with me. What I intend to lay out today is one way of understanding the journey to real happiness. It’s not something you can quickly achieve; it is the work of a lifetime. And it is, above all else, theological. A good theologian works from definitions. As Saint Thomas Aquinas once said: Never deny; seldom affirm; always distinguish. So let’s distinguish. First of all, it helps to know what happiness isn’t. Happiness isn’t money; happiness isn’t power; happiness isn’t a large-screen television; it isn’t a trip to the beach or a new car. Happiness is not found in possessions. Happiness is not found in having things or in doing things. Happiness is not found chasing pleasure. Unhappiness is a result of sin. Now, having things is not in and of itself sinful; however, it becomes sinful when those things have you. When you are owned by your possession and your focus is on chasing things, you have strayed from the path to happiness. You may find temporary satisfaction, but it will be fleeting. When it goes, and go it will, you have to chase after the next fleeting thing to maintain the illusion of happiness. All you end up doing is being exhausted and unhappy. How do we overcome this? Simple; we change our definition of happiness. Changing our definition means changing our understanding; this in turn means changing our life. God is love. He loves us actively. He loves us unconditionally. In the beatific vision, we will all understand what this means; here and now, we have usually more of an intellectual understanding, or an intellectual assent. We agree to it. We say it. But at our core, do we really understand it? Do we live it? Does it form every aspect of our life? A visceral, central understanding – an understanding of the simple fact that God is Love, and He loves us unconditionally with the perfect love that creates His being – and I am speaking of an understanding so deep that it forms and controls our entire life – would make us a saint. If we really, really understood what this means, we would all be saints, right here and now. God would be present in our lives; God would be central to our lives. We would walk with God and He with us. To say, “I could never be a saint” is to despair of God’s love. It is to say that He cannot do it; that He can’t love us totally and that we cannot accept that perfect love. Yes; it is true that you cannot make yourself a saint. But God can. Am I a saint? No. Not yet. But God is working on me, and I have total faith in Him. When I fall down, I get back up. I look at the Lord and I tell Him I am sorry. And then I move closer to Him, not because I will it but because He does. Imagine faith as a rope that ties you to God. When you are tied to Him, you live in a state of grace. When that rope is severed through the knife of sin, you are no longer tied to God. That state of grace is broken. However, when you confess your sin and repent, God ties a knot in that rope, and you once again live in a state of grace – a state of friendship with God. And what happens? The knot makes the rope shorter; you are pulled closer to God. Now, do not take from that that you should sin so you can be closer to God. That would be the mistake – or, at least, one of the mistakes – that Martin Luther made. The analogy only works if you are trying your best to live in friendship with God because you know that sin is hurtful to Him. It only works if you fear sin not because you fear the punishment, but because you fear acting wrongly and crave acting rightly. It only works if you strive to avoid sin because you want to love God and truly want to live in communion with Him. It only works if you have a right understanding of happiness. So, we are sneaking closer to a definition of happiness. We know that happiness isn’t what society tells us to want… it is what God tells us to want. And God tells us to want the Good. Yet sin is so frequently the result of wanting a good, when we should have wanted a better. Think about it. We sin, yet we rarely set out seeking to sin. It would be foolish to start the day wondering what kind of trouble you can get into now. Sin typically results from wanting something that is seen as a good – and may well be – when we should have wanted something better. Think of a married person who has an affair. This is a terrible sin, but doesn’t it result from wanting companionship and love, but seeking it in an entirely disordered way. A person who cheats on a spouse seeks a good, but that person should have sought the better – that person should have sought the love and companionship within the marital relationship; doing that would bring the person closer to God. Seeking it outside the marital relationship drives the person farther away from God. Even Abraham, seeking the good that God had promised him, sought it in the wrong way. Instead of waiting for that Good to come in God’s time, he sought it on his own. That did not work out well. Our Lord tells us that no parent would give their child a snake when the child asks for bread. If the parent seeks to give the child good things, how much more, then, is God, who is perfect, able to give us what is not only good, but the essence of Good? God gives us not just the good, but the best. So, then, happiness — the goal we all seek; the state we desire to have — comes from seeking our authentic good. So having happiness depends on understanding good. Good — and I mean the best good; the authentic good — is what God desires for us. Thus, happiness comes from seeking that good which God desires for us. The problem, of course, is in knowing what God desires for us. It’s really not that big of a mystery: God wants us to be healthy, happy, and holy. The three are not mutually exclusive; there is no reason not to have all three. He wants us to be authentically human. See, God doesn’t want us to be angels. We’re not. Angels are angels; we are human beings. We can no more be an angel than we can be a parakeet. But we can be the best human being that we can be, and that means being healthy, happy, and holy because — and this is important — being a human being means having a physical, mental, and spiritual nature combined into a single human person. Think of yourself as a perfect coconut cream pie. It has three elements that make up its nature: it has the crust – think of that as the physical self, holding everything together; it has the coconut center – think of that as the spiritual self, making up the essence of the pie; and it has the fluffy topping – think of that as the mental self, without which the pie would be flat and boring. That pie is the ideal. That’s what you want to strive toward. However, you’re probably not the ideal pie yet. If you are, you’re the pie in the sky. The authentically human pie. The saintly pie. The pie in the express pie truck to heaven. But now think of your pie with its three elements that make up human nature, and divide it into three segments of pie. The first segment is perfect coconut cream pie; that is the authentically human segment of pie. The second segment is coconut cream pie covered in hair – hair on top of it; hair inside of it. Lots of hair. That segment of pie is the animal nature pie. The third segment of pie is covered in mold. It’s inedible. It’s ruined. That segment of pie is the diabolical nature pie. We move toward happiness when we in cooperation with the grace of God increase the authentically human segment of pie and decrease the animal nature and diabolical nature segments of pie. Let me say again: we move toward happiness when we in cooperation with the grace of God increase the authentically human segment of pie and decrease the animal nature and diabolical nature segments of pie. The “cooperation with the grace of God” part is very important. If we forget that we are completely dependent on God, we have crossed the line into the heresy of Pelagianism and end up with nothing other than some weird new-agey feel-good philosophy that would itself become another huge disappointment as it would lead us farther from – not closer to – God. The goal is to grow in faith, hope, and love – to move toward God. We do this in cooperation with God; we can’t do it on our own. We think rightly when our thinking moves us toward God; we think wrongly when out our thinking moves us away from God. When we think rightly we act rightly. When we think and act rightly, we cooperate with grace and our pie becomes more human; when we think and act wrongly, we forsake grace and our pie becomes more hairy and moldy. A human pie is a kind pie. A hairy pie or a moldy pie is an unkind pie. Why do we exist? To know God; to love God; to serve God; and to be with Him forever in heaven. If I speak in the tongues of men and of angels, but have not love, I am a noisy gong or a clanging cymbal. And if I have prophetic powers, and understand all mysteries and all knowledge, and if I have all faith, so as to remove mountains, but have not love, I am nothing. If I give away all I have, and if I deliver my body to be burned, but have not love, I gain nothing. Love is patient and kind; love is not jealous or boastful; it is not arrogant or rude. Love does not insist on its own way; it is not irritable or resentful; it does not rejoice at wrong, but rejoices in the right. Love bears all things, believes all things, hopes all things, endures all things. Love never ends; as for prophecies, they will pass away; as for tongues, they will cease; as for knowledge, it will pass away. For our knowledge is imperfect and our prophecy is imperfect; but when the perfect comes, the imperfect will pass away. When I was a child, I spoke like a child, I thought like a child, I reasoned like a child; when I became a man, I gave up childish ways. For now we see in a mirror dimly, but then face to face. Now I know in part; then I shall understand fully, even as I have been fully understood. So faith, hope, love abide, these three; but the greatest of these is love. Faith, hope, and love; of course the greatest would be love, because God is Love. The Gospel makes that clear. If we go back to the Baltimore Catechism answer for why we exist and substitute the world “Love” for the word “God,” we see that we exist to know Love, to serve Love, to love Love, and to be with Love forever in heaven. Thus, happiness comes from seeking that good which God desires for us; God Himself is the ultimate good that God desires for us. So, happiness must surely come from seeking perfect Love. So, we’ve come full circle and find ourselves once again at the Angelic Doctor’s sound advice: Never deny; seldom affirm; always distinguish. We just heard Saint Paul: Love is patient and kind; love is not jealous or boastful; it is not arrogant or rude. Love does not insist on its own way; it is not irritable or resentful; it does not rejoice at wrong, but rejoices in the right. Love bears all things, believes all things, hopes all things, endures all things. All of this is what authentic love really is. What else is it? And when you see Charity, you see it says: [Charity is] The theological virtue by which we love God above all things for His own sake, and [we love] our neighbor as ourselves for the love of God. To add this to our definition, we discover that authentic happiness comes from loving God above all things for His own sake and loving our neighbor as our self for the love of God. If you hear nothing else today that I say, please hear this: everything begins and ends with the love of God. Earlier I was tap-dancing dangerously close to Pelagianism; now I’m tap-dancing dangerously close to sounding like I think all of you have to live in a convent and try to be like Mother Theresa to be happy. That – with apologies to those here who do live in a convent – is not at all the case. All of us are called to holiness; not all of us are called to vowed religious life. There is only one Blessed Mother Theresa, and she lived an authentically human life in a way that was appropriate for her. It was appropriate because that is what God called her to do. God does not call all of us to that life. Now there are varieties of gifts, but the same Spirit; and there are varieties of service, but the same Lord; and there are varieties of working, but it is the same God who inspires them all in every one. To each is given the manifestation of the Spirit for the common good. To one is given through the Spirit the utterance of wisdom, and to another the utterance of knowledge according to the same Spirit, to another faith by the same Spirit, to another gifts of healing by the one Spirit, to another the working of miracles, to another prophecy, to another the ability to distinguish between spirits, to another various kinds of tongues, to another the interpretation of tongues. All these are inspired by one and the same Spirit, who apportions to each one individually as he wills. For just as the body is one and has many members, and all the members of the body, though many, are one body, so it is with Christ. For by one Spirit we were all baptized into one body—Jews or Greeks, slaves or free—and all were made to drink of one Spirit. For the body does not consist of one member but of many. If the foot should say, “Because I am not a hand, I do not belong to the body,” that would not make it any less a part of the body. And if the ear should say, “Because I am not an eye, I do not belong to the body,” that would not make it any less a part of the body. If the whole body were an eye, where would be the hearing? If the whole body were an ear, where would be the sense of smell? But as it is, God arranged the organs in the body, each one of them, as he chose. If all were a single organ, where would the body be? As it is, there are many parts, yet one body. The eye cannot say to the hand, “I have no need of you,” nor again the head to the feet, “I have no need of you.” On the contrary, the parts of the body which seem to be weaker are indispensable, and those parts of the body which we think less honorable we invest with the greater honor, and our unpresentable parts are treated with greater modesty, which our more presentable parts do not require. But God has so composed the body, giving the greater honor to the inferior part, that there may be no discord in the body, but that the members may have the same care for one another. If one member suffers, all suffer together; if one member is honored, all rejoice together. Now you are the body of Christ and individually members of it. And God has appointed in the church first apostles, second prophets, third teachers, then workers of miracles, then healers, helpers, administrators, speakers in various kinds of tongues. Are all apostles? Are all prophets? Are all teachers? Do all work miracles? Do all possess gifts of healing? Do all speak with tongues? Do all interpret? But earnestly desire the higher gifts. Earnestly desire the higher gifts. Seek to grow in faith, hope, and love. This is vital to happiness; it is vital to right thinking; and it will transform your acts of kindness into acts of charity — which are in their nature acts of love. Becoming authentically happy means becoming authentically holy. It means growing in love for God and recognizing Jesus in the face of your neighbor. It means, ultimately, walking with God not just at Mass on Sunday, but at every moment of every day. It means time spent reading the Bible and in prayer not because you feel like you ought to, but because you genuinely want to… because you want to spend time with God, whom you love. If you’re not seeking to spend time with Him, then your love is lacking. You are cutting yourself off from true happiness. There is no King’s Highway to happiness; being authentically happy means orienting your life toward authentic happiness. It means orienting your life toward God. Prayer is key in that; you aren’t growing closer to God if you aren’t talking to Him. We’ll talk more about prayer later today. I suggest to you that laying down your life for your friends does not always mean being nailed to a cross. By that I am certainly not saying Jesus went overboard; sometimes it does mean being nailed to the cross. However, we can lay down our lives for our friends – lay down our lives for our neighbors – every single day simply by living our lives in the way to which Jesus calls us. Laying down our life daily means ordering our life to that end: for the love of God and our fellow human persons. Since we know that God desires our happiness and He gave us the Commandments for our own authentic good and that our authentic good leads always to our happiness, we can conclude only one thing: We find authentic happiness when we order our life such that we love the Lord God with all our heart, soul, and mind; and when we love our neighbors as ourselves. If this was not the case, the Law and the Prophets would not depend on it since the Law and the Prophets exist to bring us to authentic happiness, which is to say to bring us to our authentic good… to bring us to God. Thus, our theological journey is complete and we have arrived at a clear understanding of what it means to be truly happy. We find authentic happiness when we lay down our life for Love. I think this set of pictures, which I found online, has a very important message for anyone interested in the New Evangelization. The first was taken at the election of Pope Benedict XVI in April 2005; the second was taken at the election of Pope Francis in March of 2013. That so many people make such heavy use of smartphones and tablets is a fact that has received its share of criticism, and that is not unwarranted. Nevertheless, if you want to meet people, you have to go to where they are… even if where they are is a virtual place. Ready access to electronic communications through personal electronics is the reality we face today; understanding how to leverage those devices to the advantage of the New Evangelization is a task that will to some degree determine the success or failure of the undertaking. This is why, every so often, I find it necessary to walk to the top of a mountain (or a very large hill, depending on what part of the country I’m in), smoke a cigar, have a small sip of Scotch, and remember why I am alive. Little shipping container house on the prairie. Shipping container cabin in the woods. Really excellent use of shipping containers for building. I would love to have the opportunity to build something like this.